Do applicants know when I move them to the Disqualified stage? Not unless you tell them! 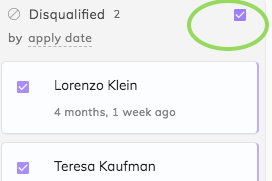 Hover in the grey area to the right of the Disqualified title and select all applicants by checking the box that appears. Next click on the 'Email' icon located underneath the job title. 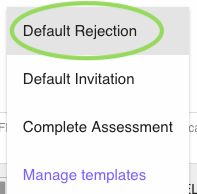 Then click on 'Apply template' and select our 'Default Rejection' template. Choose 'Manage templates' if you'd like to create your own.